must change to restore salmon and steelhead runs. This summer, we are feeling climate change in the Northwest. Rivers and waters started hot this spring and got hotter. Fishery agencies say 250,000 to 400,000 Columbia River Basin salmon are dead or will die. Sockeye salmon are the worst hit, but chinooks are dying, too, and sturgeon. Unrelieved hot water, at and above 70 degrees in the Columbia, Snake and many tributaries, is sickening and killing them. The best summary so far, by Hal Bernton in The Seattle Times, names the immediate causes: "Snowpack drought has salmon dying in overheated rivers." Water is low and water temperatures are too hot. Now comes August. Is our warming climate a contributing cause behind the immediate causes? Even in my own climate-denying Idaho, the answer can no longer be refuted. This mass die-off may be the worst signal so far of the new abnormal in our rivers, but it's far from the first signal. So a question must be asked: Why has the National Oceanic and Atmospheric Administration, the federal agency in charge of salmon and climate science, refused since 2008 to analyze how climate change is affecting Columbia River Basin salmon, and how to reduce or buffer those effects? And why does Washington state support this inaction? On June 23, two weeks after Columbia salmon were first found dead from hot water, NOAA's attorneys argued in federal court that climate impacts on Columbia salmon are too speculative to usefully assess, analysis is not needed now, and measures already in place to mitigate salmon damage by dams will also cover any speculative effects of climate change. The court case centers on whether a massive federal habitat-restoration effort in the Columbia River Basin would save salmon and steelhead. 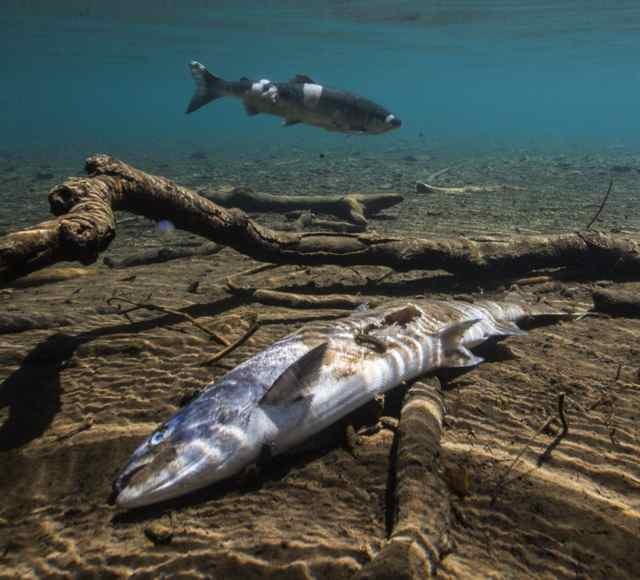 The hundreds of thousands of dead salmon in the Columbia and Snake rivers are proving that NOAA is colossally wrong. But it was just as obviously wrong in 2008 and each year since. Why so stupid a policy? The Bonneville Power Administration and U.S. Army Corps of Engineers have more power than NOAA, and use that power to block changes to dam operations. Dams are the main human-caused killer of Columbia and Snake salmon, and honest climate planning would surely lead to changes at the dams. NOAA has tortured its mission, science and climate leadership to duck analysis that bigger dogs don't want done. Now salmon are shouting, "Mistake!" What should be done? The federal court's verdict, expected soon, will rule whether NOAA's climate inaction is wrong. If the court orders climate planning for salmon and their rivers, NOAA would write it. But it would take a U-turn within NOAA and sustained White House attention to reverse the conscious lethargy behind this mistake. The Northwest needs President Obama to insist on it. There's a second path: Some years ago, I attended a congressional hearing on salmon. When a witness said climate change was an issue for the future --its effects on fish, rivers and people needed no attention now --then-U. S. Rep. Jay Inslee interrupted with memorable passion. How can you say that, he asked? Look at the evidence, Inslee said. He was right then. And, despite Washington's support for NOAA's climate denial regarding the Columbia River, he is right now. Inslee is a climate champion, so he should take action. Puget Sound orcas also eat chinook salmon, and would benefit from changes to the operation of the Columbia and Snake dams. The salmon die-off is bad for orcas now, but worse for their future unless we act. If Gov. Inslee, Oregon Gov. Kate Brown and Montana Gov. Steve Bullock asked for honest, science-based, inclusive climate planning for salmon, people, and for the waters in the Columbia and Snake Rivers, and promised to participate, it would happen and be good for the Northwest. Whatever the court rules, I hope these three good governors will put it on their hot list. Pat Ford lives in Boise, Idaho. He worked for the Save Our Wild Salmon coalition from 1992 through 2013, but this column reflects his own views.